Video recorders Neo HD can be easily mounted on a wind screen of your vehicle with the help of fixing devices that are included in package; it is fed from regular jumper socket. Video recorder starts and continuously records automatically after power is supplied. Neo HD as opposed to many similar devices keeps recording continuously without any breaks, which the main criteria for selection of a video recorder, because even 30 second pause between recordings can be critically important on the road where situation can change immediately. In case of a sudden power breakage Neo HD will always take time to finish recording and will save it to memory card. microphone and two record indicators and GPS. 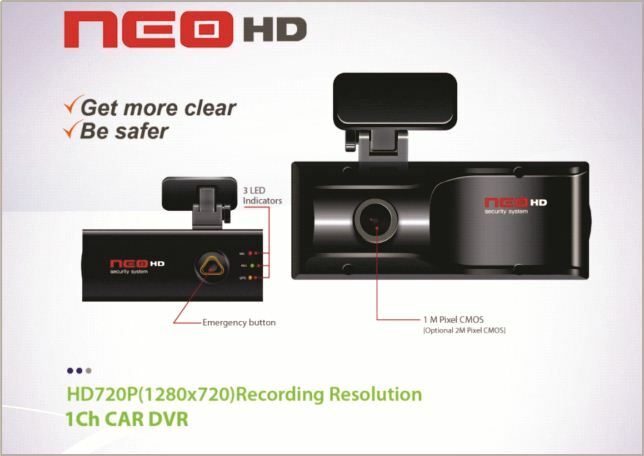 Video recorder NEO HD has the function of GPS monitoring, thus you will be able to watch not only video but also information about speed and location of a vehicle that altogether with time information help a car owner to identify his vehicle. Video recording starts automatically immediately after connection to power supply. And it stops automatically after power supply of the video recorder is disconnected.